Last Sunday I visited a friend for the evening... we watched Cry Baby, drank coffee too late at night, and made things with balls of wool. 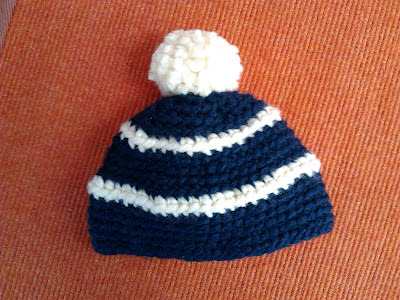 I crocheted this tenny tiny hat for my cousins brand new little man, Tom. Pom Pom Rug Update: No progress. But how cute is this baby hat with a pom pom on top? !